Click the button below to add the Generac 7038 20kW Guardian Generator with Wi-Fi to your wish list. NEW 2018 WI-FI MODEL (SAME AS MODEL 70381). The Generac 7038 is run by the Generac G-Force Engine. This engine is strong and stable, capable of handling strenuous use, is pressure-lubricated, and requires less regular maintenance than most engines. Maximum 20000 LP Watts and 18000 NG Watts. It operates at a reasonable 66 Decibels, offering a quiet power solution. The True Power Technology in this model means reducing harmonic distortion to less than 5%. This equals cleaner quality of power for sensitive devices and appliances. The Quiet-Test Self-Test Mode runs the generator at a lower RPM while it performs a five or twelve-minute test. It is also a more fuel-efficient model. This model features Generac’s Evolution Controller. This LCD display monitors the battery and maintenance schedules, and operates with multiple language options. A Mobile Link Remote Monitor (sold separately) allows you to check upon your generator, even when you’re not at home. Anywhere that you get mobile service with your laptop, phone, or other smart device, you can access your generator’s status. You can view scheduled operations, customer service requests, and much more. Residential standby generators must be durable, and the Aluminum Enclosure and RhinoCoat powder-coated finish are keys in helping this model resist the elements, including 150 mph winds. 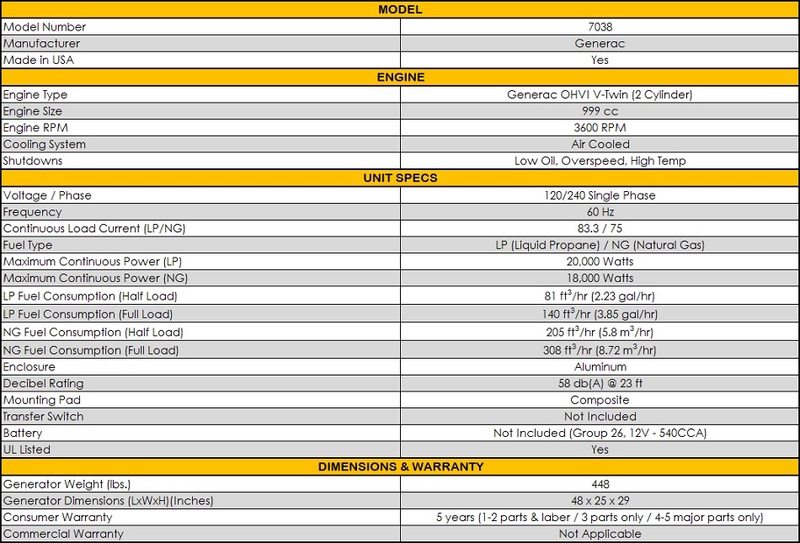 The Generac 7038 comes with a 5-Year Limited Warranty. Generac takes pride in customer service, and offers 24/7, year-round customer support. Generac generators and their engines are constructed in the USA. This model does not include a Transfer Switch. The Generac 7038 20/18kW Air-Cooled Standby Generator is a powerful residential backup generator. It’s energy efficient with its Generac G-Flex Technology that allows it to provide only as much power as is necessary to the home, and thus use less fuel. It offers quiet, clean power for all of your home’s devices, even the sensitive ones. It is a perfect backup power solution for those concerned with power conservation. The Generac 7038 contains a Generac G-Force Engine. The G-Force Engine is a durable and constant source of power; it is pressure-lubricated and can withstand long-term, vigorous use. It also needs maintenance less often than other engines. This generator model also has G-FlexTM Variable Speed Technology. This means that the unit determines how much electricity is required at a given time and only provides that amount, rather than running the same amount of power at a constant rate. This makes the 7038 more fuel efficient. I still powers well, with a max of 20000 LP Watts and 18000 NG Watts. In terms of size, it measures 48 inches long, 25 inches wide, and 29 inches high, and weighs about 456 pounds. Though the 7038 does not come provided with an Automatic Transfer Switch, it still offers substantial power. Its electricity is quiet at 66 Decibels and is clean with the help of True PowerTM Technology that decreases harmonic distortion. At less than 5%, this low distortion means safer power for delicate appliances and devices. The Generac 7038 also has a Quiet-TestTM Self-Test Mode that lowers the generator’s RPM so that is can run a twelve or five-minute self-test. The Generac 7038 20/18kW Air-Cooled Standby Generator features technology that make for easier homeowner use. The Generac’s Evolution™ Controller includes an LCD display so that you can monitor the battery levels and maintenance needs and schedules. You can view this information in several languages. Additionally, you can add Mobile LinkTM Remote Monitor. This feature is sold separately and lets you check up on things when you’re not at home. All you need for this part to work is an internet connection and a computer, smartphone, or tablet. With these, you can connect and view your unit’s status, service requests, and more. Generac works to make durable products in the U.S.A. In addition to technology, the 7038 also has an Aluminum Enclosure and RhinoCoat powder-coated finish that allow it to survive the elements, such as 150 mph winds, and other long-term damage. This generator comes with a 5-Year Limited Warranty, and Generac’s year-round, 24/7 customer service. I have had my Generac 7038 for about 9 months now. Works great. Not one issue so far. I purchased my Generac 7038 20kW about a year ago so it has been in service for about a year. No issues whatsoever. Good product and would recommend. I have been installing Generac generators for years. Their 20kW generators are very reliable. Also I have never had an issue ordering from AP Electric. the Generac 7038 20kw generator that I ordered from this site arrived quickly and undamaged. Happy with my purchase and the service I received. No issues with my purchase of this Generac 7038 20kw generator. Shipped super fast. Wow, very lucky. I ordered my Generac 7038 20kW 10 days before Hurricane Mathew hit. My electrician installed it 3 days before the storm. Storm hits, generator fires up. Ran for 3 straight days without and issue. I am still smiling. Not much to say. Great experience. Good tech support, the generator shipped quickly, best price I could find on the web. Generator works great. Very satisfied.